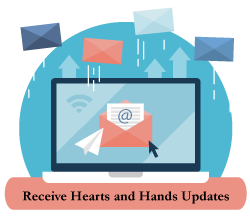 Residents throughout WNY are receiving assistance thanks to Hearts and Hands. However, the scope of our involvement in communities varies greatly. And we are far from providing for all of our neighbors who need the help. Our volunteers provide support services to individuals living in Niagara County and communities in Erie County including Akron/Newstead, Alden, Amherst, Boston, NY, Clarence, Holland, Marilla, Wales, and the Tonawanda Indian Reservation. To learn more about our services, please visit our services page. Within those communities, we have a strong network of organizations that believe in what we do and are willing to talk about us to their congregations, supporters and members. These organizations send interested volunteers, ambassadors, and care recipients our way. Are you involved with a local worship community or organization? If so, we are happy to make a call and introduce ourselves. Once folks understand how easy it is to volunteer for Hearts and Hands, we can get to work helping those in need in your community. If you are interested in learning more about our organization or volunteering, please call us at (716) 406-8311.